Welcome to Marvel Strike Force Heroes page. This is the full description of MSF Quake stats, skills and abilities. Quake is a S.H.I.E.L.D. Controller who determines the course of the fight with Slow and Offense down. Her first skill hits primary and adjacent targets for the small amount of damage but it also applies Slow for two turns on both primary and adjacent targets. Her second skill inflicts medium damage and has a chance to chain to 2 adjacent targets as well. Additionally, it also clears the positive effects of the primary target. Quake ultimate delivers 270% of her base damage to all enemies and applies Offense Down to all targets. Her passive ability grants her even greater focus. Quake is probably the best Controller in the game at the moment but she is not that good when the computer controls her because A.I. doesn’t use her skills properly. Quake price is 45 shards which can be farmed in the Arena store, Mega Orbs, and Premium orbs. Quake is a S.H.I.E.L.D. agent who disrupts the enemy team by weakening groups of foes and removing their advantages. 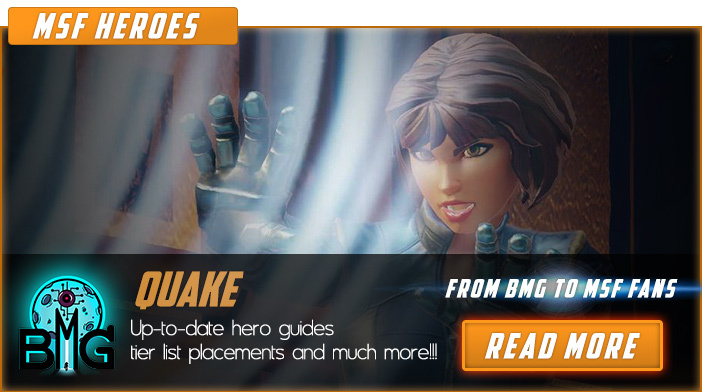 We hope that you enjoyed the description of MSF Hero Quake. For detailed information about other MSF Characters check our MSF Heroes page.